When it comes to Italian food, there are certain ingredients that are synonymous with that Italian flavor. As we’d mentioned in our last blog, some of those ingredients include artichokes, basil, and mushrooms… but the list goes on. We’re continuing that list – so just as we do in our restaurant, we’re offering up Italy’s most famed ingredients in today’s blog. What’s Italy without the famous olive. 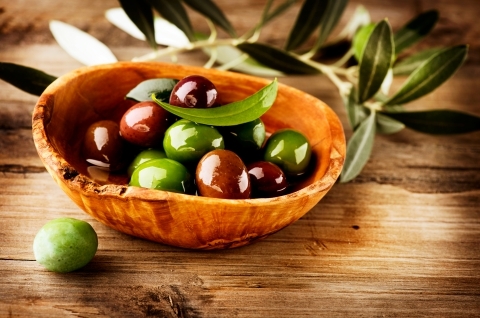 Italy is home to a litany of olives, including the gaeta, the bella di cerignola, and castelvetrano varietals. Most Italian cuisine uses ripe olives (unlike the green olives that have become popular here in the states). However, due to the large number of olive species, you can find olives of all sorts of colors in Italy, including black, maroon, dark green, mustard, and brown. You can find olives scattered throughout the traditional Italian menu, including inside sauces, atop salads and pizzas, and much more. Of course, olives can also be enjoyed solo! Okay, olives and olive oil go hand in hand, sure. But we’re going to take a moment to make the distinction. Olive oil is a healthy oil that’s prevalent throughout traditional Italian cooking. Now, there are several types of olive oils out there on the market, including extra-virgin olive oil, virgin olive oil, cold-pressed olive oil, extra-light olive oil, and pure olive oil, as well as infused olive oils. We’ll delve into the differences amongst this smorgasbord of olive oils in a future blog (so check back!). Sauteeing garlic fills a kitchen with savory smells. Whenever garlic hits hot oil, hungry citizens gather by the thousands. Okay, that’s hyperbole, but who doesn’t love the scent of cooking garlic? Italians certainly love it as much as Americans. Garlic is a prevalent ingredient throughout authentic Italian meals. You’ll find it on your pizza; you’ll find it in the sauce atop your spaghetti; you’ll find it on the breadsticks that await you before your meal; you’ll find it in your minestrone; you’ll find it in your gnocchi. And of course, it’s a crucial ingredient in pesto. If olives aren’t at the top of the list, garlic may take the number one spot as the most integral ingredient in Italian cuisine. You’ll find them in your sauces. They grace the top of your pizza margherita. 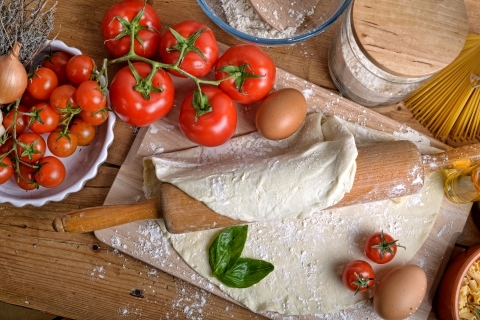 Tomatoes are a crucial element in many, if not most, Italian recipes. Italian’s traditionally rely on two varieties of tomatoes: Soft, round tomatoes that are easily sliced into discs and wedges (these are excellent pizza toppers and salad mixings); and then there are the long, thin tomatoes which provide a more firm structure that’s less juicy. The Roma tomato is a popular choice for its thin shape and thick consistency. Roma tomatoes can also be processed to produce tomato paste. Did you know that the Roma tomato is also known as the Italian tomato? If you’re looking for authentic Italian ingredients, you don’t have to buy a plane ticket to cross the Atlantic. Just stop in here at La Cucina Italian Eatery. We connect local Conshohocken residents with the finest food Italy has to offer! Check out our Italian cuisine menu here!